Home >> A Books >> A New Twist on Explorers! A New Twist on Explorers! If you've been searching for a different way to introduce your students to the world of famous explorers, your search has ended! Workman Publishing introduces Explorers, the latest in its Fandex Family Field Guide series. The unique format of this new "book" will engage young historians and motivate them to explore more about 50 of the greatest adventurers in history -- famous explorers everybody has heard of and some lesser-knowns too! It just got more fun for students to explore the explorers! Workman Publishing has introduced a new title to its series of Fandex Family Field Guides. Previous editions have spotlighted trees, U.S. presidents, the Civil War, and dogs. Now Explorers makes its debut! Have you seen other entries in the Fandex series? If not, you're in for a treat when you take a look at Explorers! 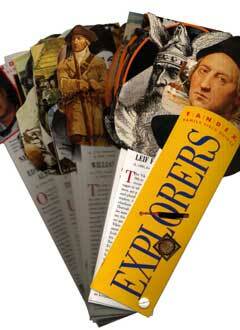 Fifty die-cut cards present a chronology of the world's greatest explorers. Fan out those cards (see photo) to reveal a history of heroes of land, sea, and space. Students in elementary and middle schools love the Fandex series. Its unique format delivers to them a deck of knowledge -- at their fingertips! Teachers love them too! Explorers offers a handy reference guide to the great names in exploration. Each explorer's brief biography, written by Steven M. L. Aronson, hits the high points. Explorers is an ideal tool for engaging students. Once their students are engaged, teachers can challenge them to learn about a particular explorer in more depth. Aronson has included all the big names in exploration -- from Columbus to Cousteau, from Henry the Navigator to Henry Hudson, from Balboa to Byrd. Many lesser-known, but very important, names pop up too. Amerigo Vespucci. Sort out fact from fiction in a brief biography of this unquestionably remarkable explorer. But were all the voyages he is said to have made legitimate? Or were some of them, as some historians contend, the creations of a man bent on making his name a household name? Henry Hudson. In 1609, sailing for the Dutch East India Company, Hudson turned yet another failed attempt to find a northeast passage to the Orient into a Dutch claim on lands along what is known today as the Hudson River. A follow-up trip would lead to a mutiny by Hudson's crew -- and Hudson's death. Lewis and Clark. Under orders from President Thomas Jefferson, these two explorers set out on a trek financed by Congress. With the successful completion of their journey, the United States now stretched "from sea to shining sea." No longer was it just a stretch of states along the Atlantic Ocean with a lingering connection to Europe. More than 50 great names in exploration are included in this Fandex deck. All cards are in full color. Dozens of historical images and photos bring to life the pursuits of boundary-breaking heroes. At a bargain price of $9.95, it's no wonder the Fandex series has so many fans! Explorers (Fandex Family Field Guide) is available in bookstores everywhere. If you are unable to locate it, ask your bookseller to order it for you or contact the publisher directly. Explorers, written by Steven M. L. Aronson, is published by Workman Publishing, 708 Broadway, New York, NY 10003-9555.